Through months of preparations and thanks to many helping hands, our fair booth at this years´s Orgatec was again an eyecatcher. Those of you who couldn´t come can visit it virtually. Reefs is inspired by the infinite variety of the underwater worlds. The modular structure of the system enables its versatile, individual configurations. On the Reefs islands people can engage with each other and develop new ideas with teamwork and creativity. This year, the Dauphin Group celebrates its 50th anniversary. Our focus on outstanding quality, sophisticated design, and the evolution of ergonomic work environments makes us one of the leading providers of the office furniture sector. Join us on a little journey through time! Since I founded the business in 1968, my family and I have run it with the utmost commitment and highest standards. Today we are one of the leading providers of the office furniture sector. Without you, dear partners, customers, and colleagues, this would not have been possible. That’s why I want to say thank you for fifty years together. I am looking forward to the next decades with you. Less is more. A clever invention meant the breakthrough for Friedrich-Wilhelm Dauphin in the early 70s: He designed an office chair with the model number 1000 that was made almost entirely from conical, pluggable parts. It could be packed in a space-saving way that enabled economical shipping – a crucial competitive advantage, particularly for the export business. To mark the company’s 50th anniversary, the successful model got a makeover and is relaunched in many variations as 1000 classic. A modern classic with esprit that is still relevant in the New Work era. More modern, more flexible, improved acoustics, and nice to look at from all sides. With acoustically effective, electrified, freely configured panels on the inside and outside, anything the customer requires. This is the new Bosse cube 4.0. TRENDOFFICE – WORK IT: EASY! We are inspired by people and the environment they live in: The world is turning faster and faster. Modern life is complex, confusing, dynamic and even restless. We present a constant against this fast pace of life. Timeless design, longevity, simplicity and yes, also honesty. An office chair that is not just for the office. But for people. For you. Which ensures that you don’t work just somewhere but where you feel at home: at your favourite place – in line with our motto: Work it: easy! The new Züco Selvio task chair is a blend of distinctive design and perfect ergonomics. The designer Rüdiger Schaack created the entry model to the sophisticated world of Züco to be truly eye-catching. The distinctive design of the slender backrest recalls the double S-curve of the spine. But the Züco Selvio does not only make a visual statement; it also supports focused work. The fully upholstered version of the Selvio is visually understated and elegant; the version with the mesh backrest made from elastic Rhythm fabric exudes a modern, futuristic vibe. Black is beautiful. Whether in cars, in fashion or in furniture, black looks refined and elegant and can be used to make deliberate statements. Fiore also cuts a very fine figure with ist black powder-coated frames. They blend perfectly with the warm shades of the wooden shells, whereas the contrasting combination with white or coloured plastic shells presents an extravagant highlight in a room. The modern world of work requires flexibility and demands efficiency. New office concepts are propagated and rejected again. The Dauphin HumanDesign® Group offers solutions for any workplace and any form of organisation. The primary focus is always on people and their needs. 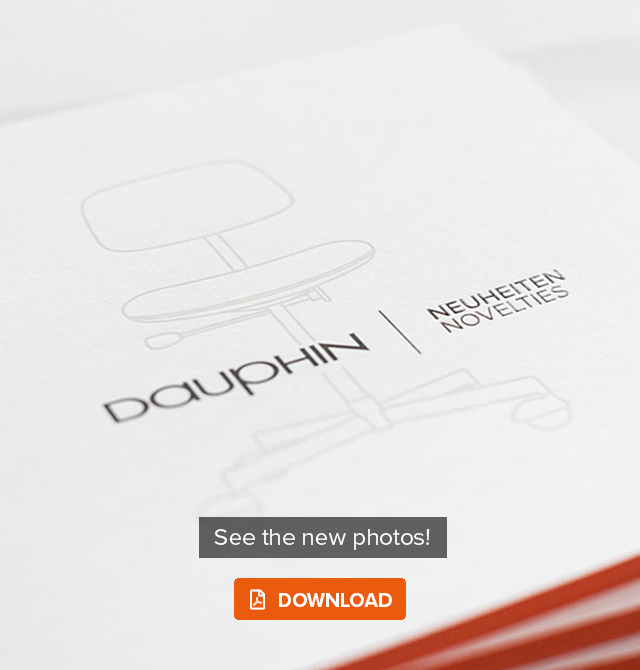 Be inspired by our Dauphin office world - with new solutions for flexible, individually configurable zones for the different activities that characterise modern day-to-day work. Welcome to the Dauphin office! The distinctive design of the Züco Signo blends seamlessly into any environment. The office executive swivel chair is available with three ergonomically shaped backrests of different height. The Signo Task with elastic Omega fabric provides an ergonomic chair with the full range of features and an adjustable lumbar support. The entire range is now available as a black edition. 1 idea, 1000 possibilities gets updated with the modern classic black. Tubes, connectors, handles, feet, castors – everything that has previously determined the character of modul space in shining chrome now gets an elegant, subtle feel with a black powder-coated finish. This creates entirely new impressions and the opportunity for our classic to remain modern and timelessly beautiful in the long term. Not too expansive, yet very comfortable and elaborately crafted: the new Züco Destino lounge range. Bosse is also revising its highly successful telephone cube. The modern telephone booth looks great in almost all areas that require optimum acoustics on little space. The lightweight combines the elegant Züco design and supreme comfort. The goal: get comfortable, don’t just sit around. From relaxed, comfortable office seating to focused meetings and all the way to prestigious executive offices.